At the 2019 Oklahoma City Farm Show, Radio Oklahoma Ag Network Associate Farm Director Carson Horn sat down with Cheyenne Laux of AgDrone Pro, an agricultural drone mapping and analytic service. Using the most advanced technology, Laux explained how AgDrone Pro gives producers an eagle eye view of their entire field to help them precisely evaluate and plan for the highest and healthiest crop yields. 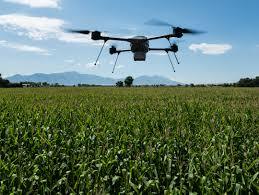 AgDrone Pro allows producers to monitor crop growth and protection measures in real time. By identifying areas of concern, AgDrone Pro can advise producers on how to proactively respond with targeted measures of care - saving time, money and potential losses. AgDrone Pro uses military-grade drones and technology, capable of flying up to 360 ft. above your fields. With data driven results and personalized service, their agricultural scouting drones they deploy allow you to see data in terms canopy coverage, areas of stress in your crop and also allow you to track growth over multiple seasons. According to Laux, the multispectral imaging used by AgDrone Pro is very effective in evaluating soil productivity and analyzing plant health. He says, viewing the health of soil and crops with the naked eye is very limited and is reactionary. Multispectral sensor technology, on the other hand, allows you to see further than the naked eye. Data from multispectral imaging is proven to help identify pests, disease and weeds, optimize pesticide usage and crop sprays through early detection, detecting nutrient deficiencies, count plants and determine population or spacing issues, estimate crop yield, measure irrigation and more. Learn more about AgDrone Pro and how their services can help you on your farming operation, by clicking or tapping the LISTEN BAR below to hear Horn’s complete conversation with Laux or click over to their website here. Be sure to stop by and check out AgDrone Pro and other great vendors like them at the OKC Farm Show, April 4 - 6 at State Fair Park in Oklahoma City. Click here for more information. Listen to Horn speak with Cheyenne Laux about the unique scouting service of AgDrone Pro, below.